“These are extremely significant polling numbers. They offer a snapshot of the American Jewish community regarding the values and issues that are the highest priorities, though these are not the issues that are front and center in our communal debate,” Madelon Braun, the president of the Workmen’s Circle, said in a statement Thursday. 65 percent of American Jews support raising federal income taxes for people who make more than $200,000 annually, the poll found. The poll also found that neither attachment to Israel nor confidence in Israelis vs. Palestinian Authority Arabs as peace seeking strongly factor into Jews’ presidential vote decision. The poll found that Obama voters and Romney voters do differ on Israel; Romney voters are more attached to Israel and more confident in Israel’s commitment to peace. However, these differences are totally explained by prior factors like religiosity and political ideology, than are the primary determinants of Obama vs. Romney preferences. 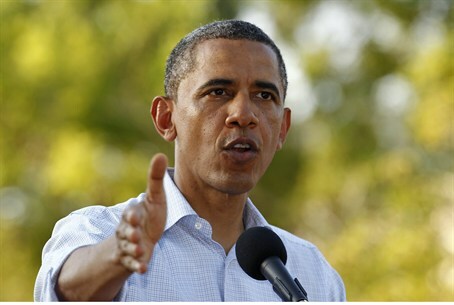 Obama has come under fire for his policy on Israel. In his foreign policy speech last May, Obama called for a return to the 1949 armistice lines (often erroneously called 1967 borders) as a starting point for negotiations with the Palestinian Authority. Obama’s policy on Israel may have come at a price. Recent reports have indicated that Obama has lost 16 percent of his support among U.S. Jews and may lose the elections in key states like Florida, come November. “Pastrami & Politics”, a video recently uploaded to YouTube, reveals some strong and confused attitudes that Jewish Americans have towards President Obama and his policy on Israel. The video was filmed by Rabbi David Nesenoff, who personally walked up to people seated at several kosher delis in New York, asking them about the food and then proceeding to inquire about Obama and Israel. Some of the people shown in the video admitted having voted for Obama in 2008 but at the same time said they are now reconsidering their vote in the November elections. Recent reports indicated that the Republicans now believe that Romney has a genuine shot at winning the presidency.